Signal Hill started to develop in 1986. It is part of an elevated plateau resulting in some homes offering great views of the mountains and the Elbow River Valley. In the First World War, the Canadian Armed Forces used part of Signal Hill for training. The numbers on the hill, belonging to some soldiers, were created with white rocks. 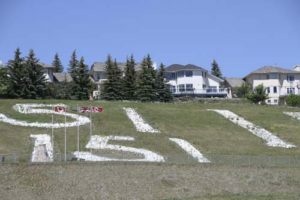 Click here to learn more about this landmark in Calgary. Signal Hill has views of the foothills and Rocky Mountains. On top of the hill you will find homes over $ 1 million with the most expensive home sold at $1,250,000. Starting price of single family homes is around $400,000. 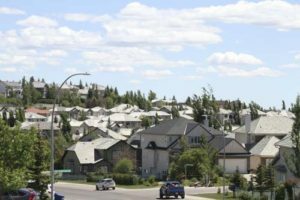 Signal Hill Calgary offers both single family homes as well as condos. Some condos are 50+ buildings. The Signal Hill shopping centre and the Westhills Towncentre combined is a fairly large outdoor mall that offers almost everything, including two large supermarkets and a movie theater. The community also has a library. Signal Hill has one school, Batallion Park School, serving K to 6 students. It currently serves the southwest communities of Signal Hill, Richmond Hill and Springbank Hill. 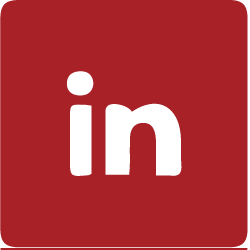 Find More information on schools in Calgary here. Battalion Park overlooks the Westhills and Signal Hill shopping centres. In Signature Parke, the community North of Signal Hill is the Westside Recreation Centre, a great indoor centre for swimming, fitness, hockey and much more. Signal Hill Calgary has an active community association. For crime rates on this community visit the website of the Calgary Police. For more information on Signal Hill, Signature Parke, Richmond Hill, Springbank Hill or any other community, call us at 403 630 5190 or email us.